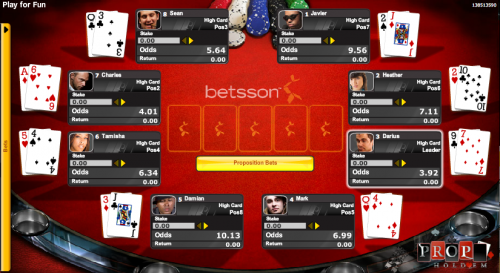 There’s something a little different in this review and we’re venturing into the world of poker to take a look at Betsson Casino‘s Switch Hold’em Pro. Before any slots players get nervous about playing this most famous of games, it’s worth mentioning that you’re not actually playing poker; all you’re doing is betting on who is likely to win. The game is Texas Hold’em and the rules are pretty simple; each player starts with two cards and the aim is to make the best five card hand by combining your cards with the five ‘community cards’ face up on the table. Read on for more in depth rules and gameplay descriptions. To begin with you are presented with a poker table with eight players; the cards are face down and each player starts with the same odds of winning a hand. If you like you can choose to bet now by clicking the small yellow arrow underneath the player’s photo or you can wait for the next stage. When you click the ‘Submit All Bets’ button you will get to see everyone’s cards (if only real poker was like that!) and now you can choose to bet again. Notice the odds have now changed to reflect the strength of the hands. If you’ve bet or if you’ve chosen not to, click the ‘Submit All Bets’ and the first three community cards will be dealt, altering the odds once more. Bet if you like and click again. Note that players who cannot win may fold their hands. The fourth community card is dealt and then the fifth, this time revealing the winner. If you bet on that person you win at the odds at the time you placed the bet. You can place different bets on the same person at different times, these can payout at different odds. You can click on the vertical strip labelled ‘Bets’ on the left hand side to check the bets you’ve already placed; this can be important when you’ve placed lots of bets. Proposition bets are sometimes a part of normal poker play and you can take part here as well; ‘prop’ bets are side bets on other things – in this game you can bet on the outcome of the community cards. You can pick ranges of numbers to be dealt, suits or card colours and it adds some extra excitement to the flop, the turn and the river (the three occasions community cards are dealt). 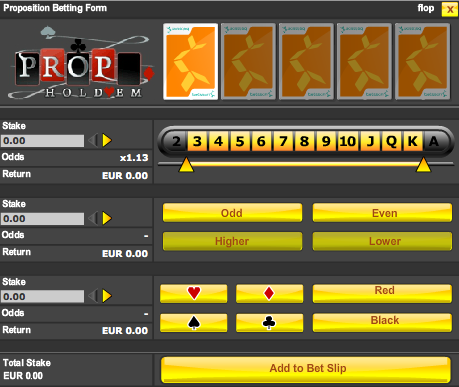 We really like this game; it turns standard poker play on it’s head and gives you loads of betting options. It’s also quite possible to win as long as you keep track of the bets you’ve laid in each round.